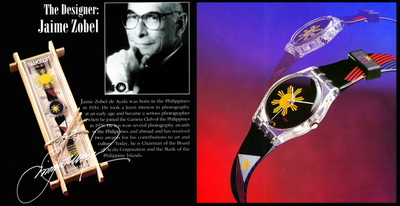 "Swatch Switzerland had commissioned Jaime Zobel de Ayala to design a watch to commemorate the Centennial of the country's official proclamation of independence, an event to be marked on 12 June 1998. Zobel's design is inspired by the Philippine flag, the most identifying national symbol. The Centennial Swatch displays the shining sun of the flag on its face, while a neo-classic rendition of the flag wraps around its straps. Packaging of the watch is characteristically Filipino and features native materials such as bamboo. Zobel's interpretation of the spirit which guided the Filipinos' struggle for independence deeply impressed the Swiss Swatch makers to release the watch worldwide."